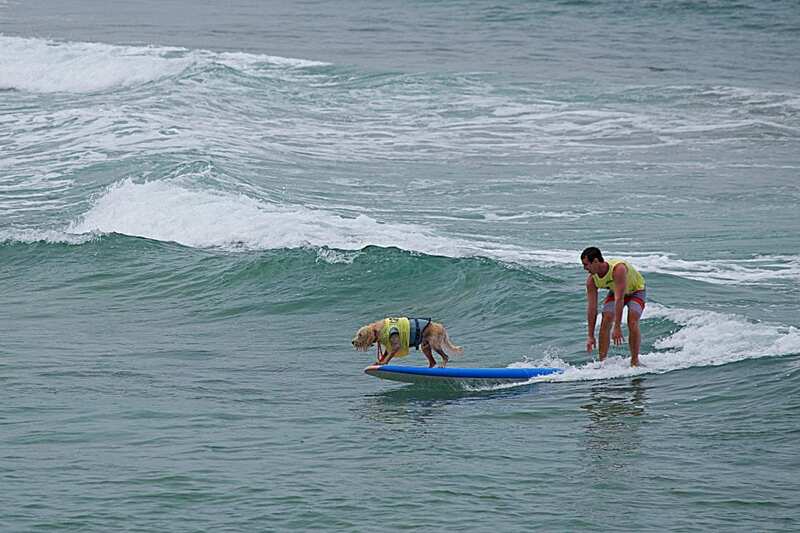 What makes a good surf dog? They have to trust the board as a safe place. 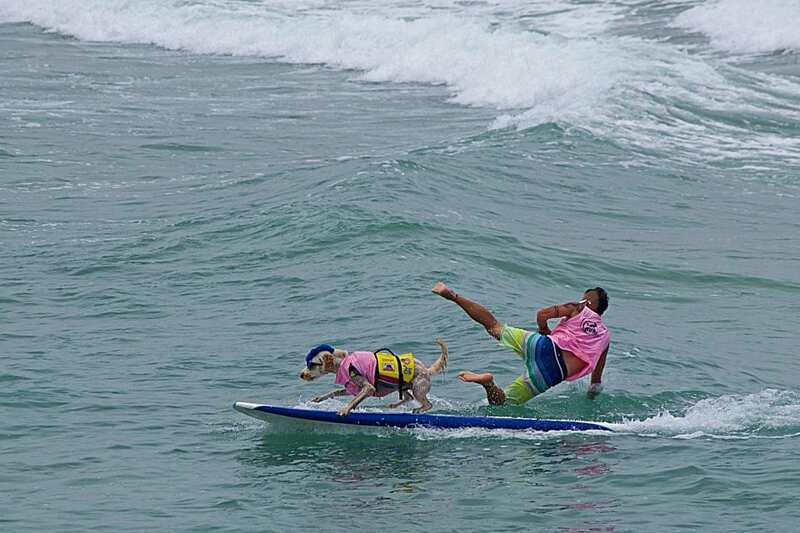 If the dogs see the beach and run to the front of the board – no bueno. That’s a recipe for pearl city. That is just for starters. 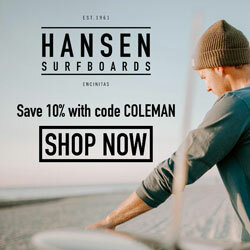 They get bonus points for classic longboard tricks like a 360 or even just executing a bottom turn to go parallel to the beach. Takeoff matters too. You want to be well positioned on the steep part of the wave so you can catch the wave face and not just be riding the white wash. 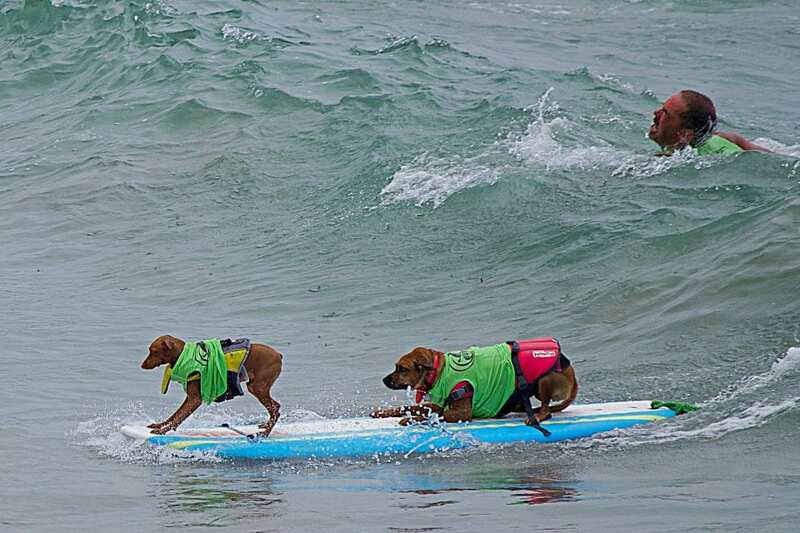 In short, catch big waves and look cool. 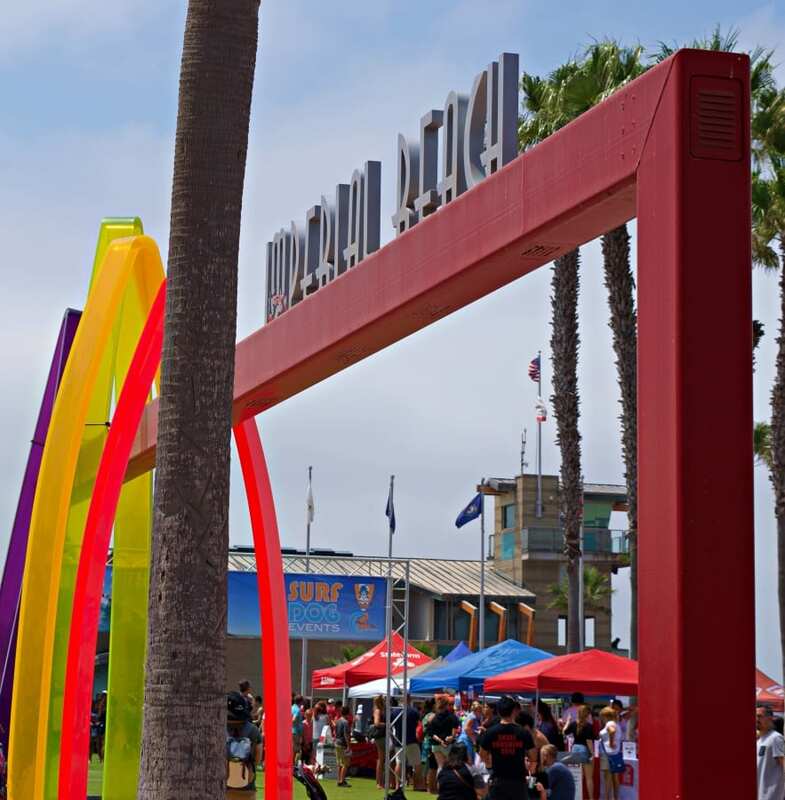 We broke our cardinal Coleman Concierge rules and didn’t get into the thick of the action on the beach. We sat back on the pier but still caught enough cute photographs to make this post happen. 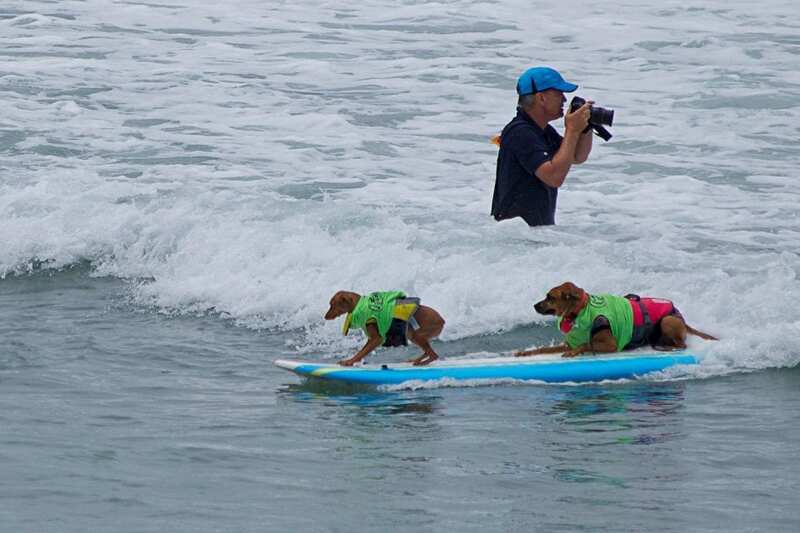 Really, how wrong can you go with photographing dogs surfing? That’s the story we keep telling ourselves. 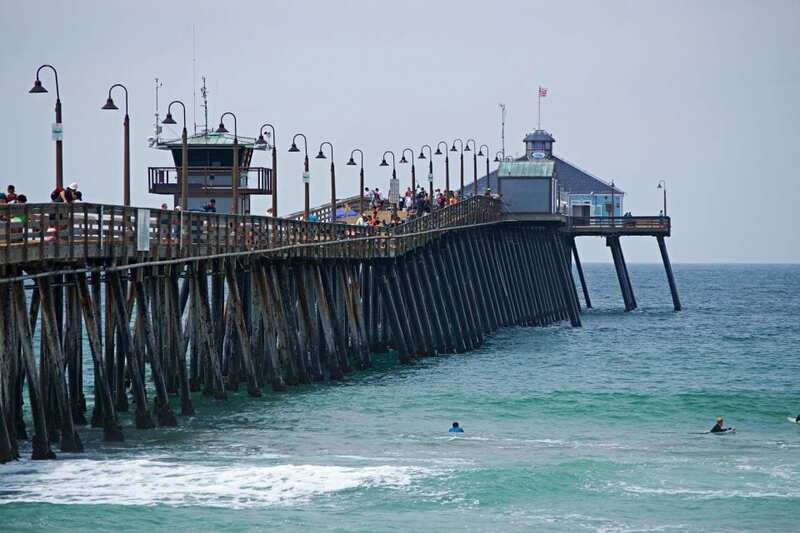 Imperial Beach is a beach city south of San Diego. It’s only a couple of miles north of Mexico, but you can still see the San Diego skyline. It’s not as posh as La Jolla or as busy as Mission Beach, but it does have a vibe all of its own. 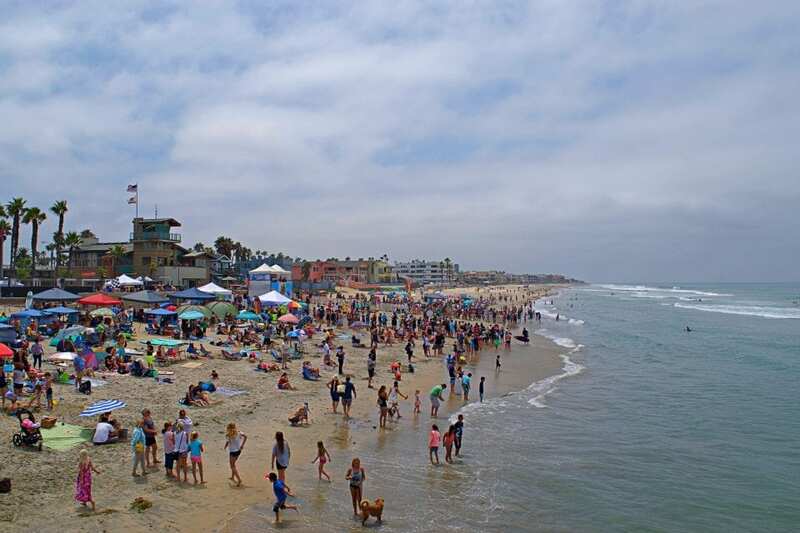 About three thousand people took to the beach to watch the show. 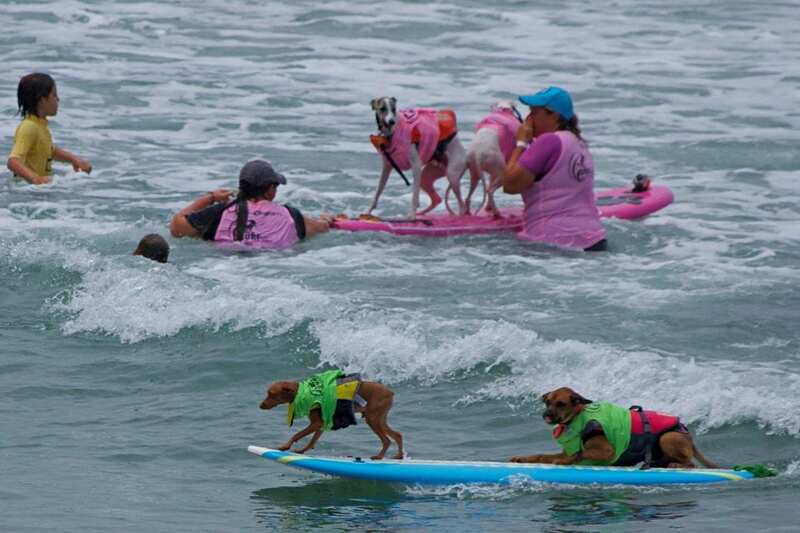 The IB pier was loaded with dog surfing fans too. 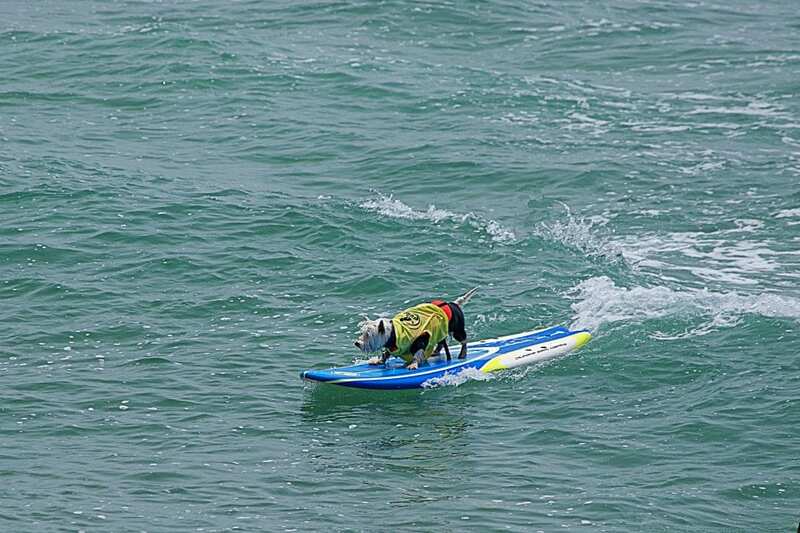 Now, it doesn’t take much to be a dog surfing fan. It’s hard to watch without smiling. We noticed a trend going on, people dressing up their dogs. 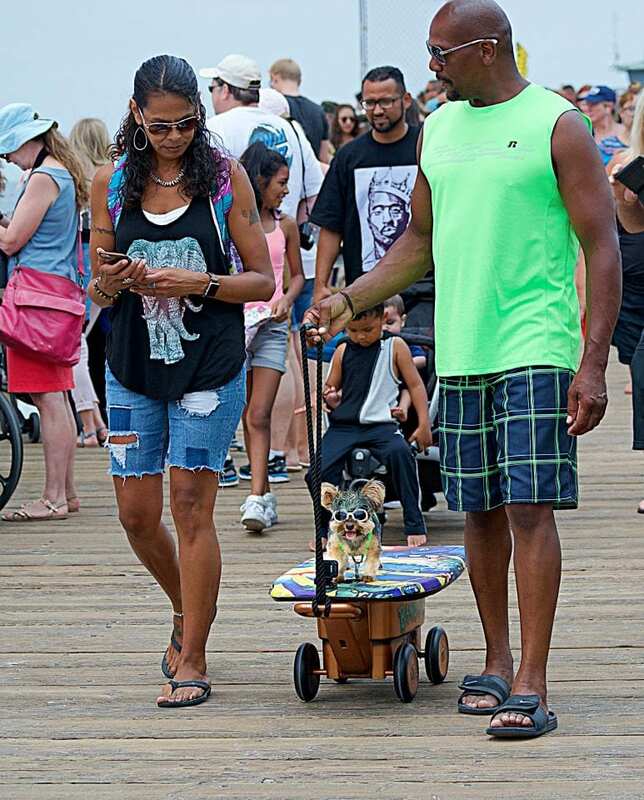 Some people dressed up their dogs as surf dogs and wheeled them around on pimped out wagons. But it wasn’t all fun and games…. 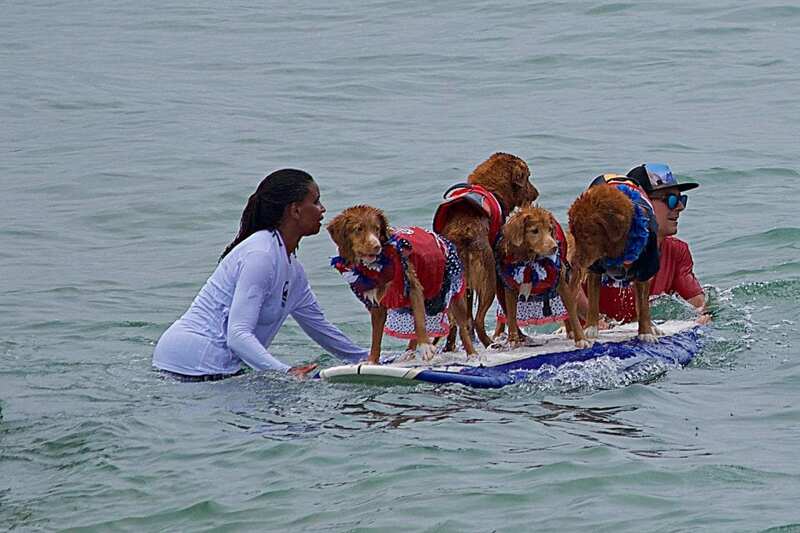 There was an organized effort to break the Barknado record. 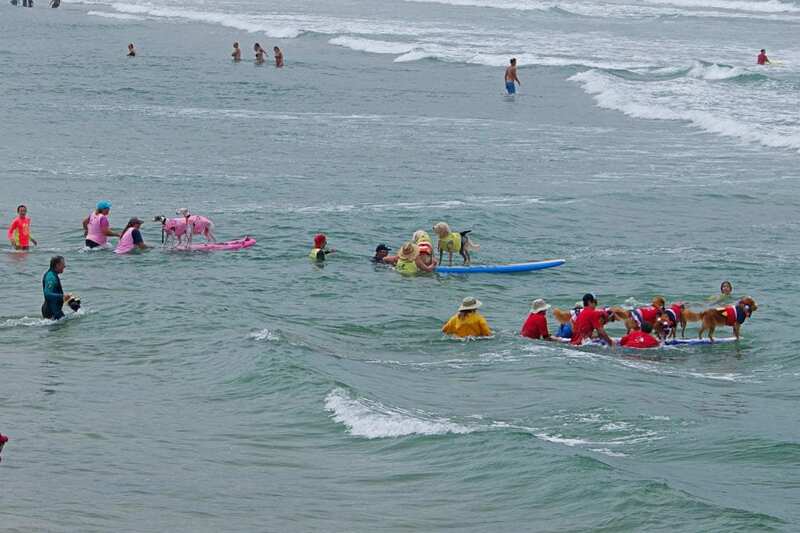 61 dogs were dressed as sharks on the beach. 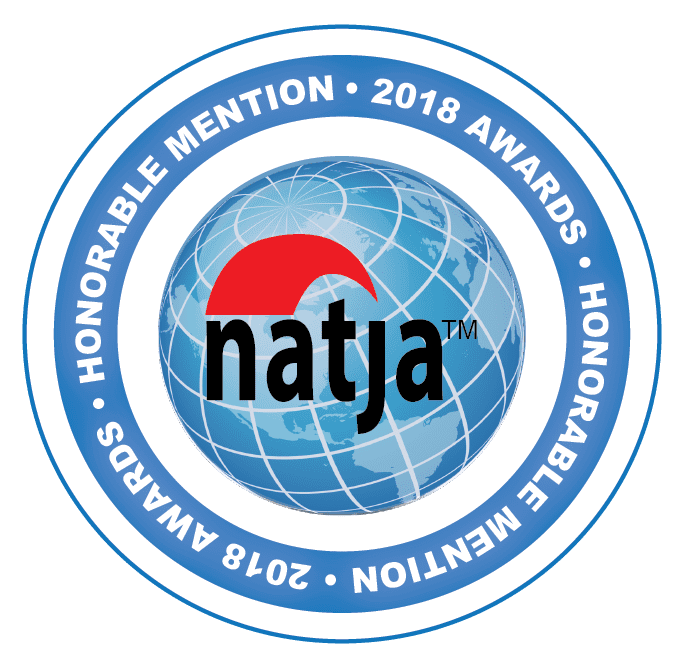 This should be enough for the world record, but the results aren’t official – yet. 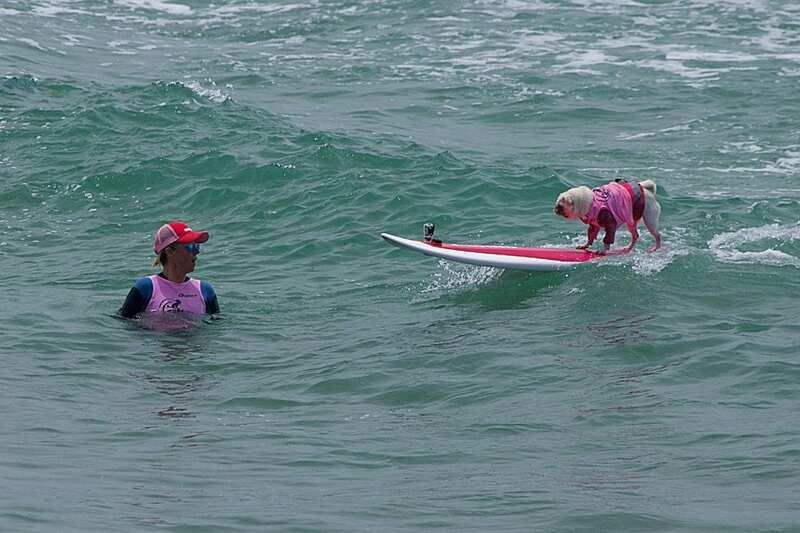 I have been surfing for about four years now. 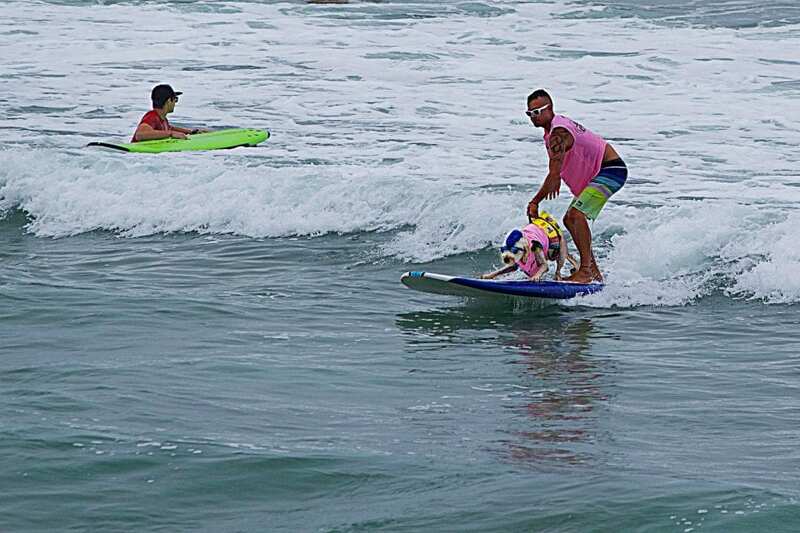 Learning to surf over 40 was harder and more painful than you could imagine. The quest is always to catch that unbroken wave. 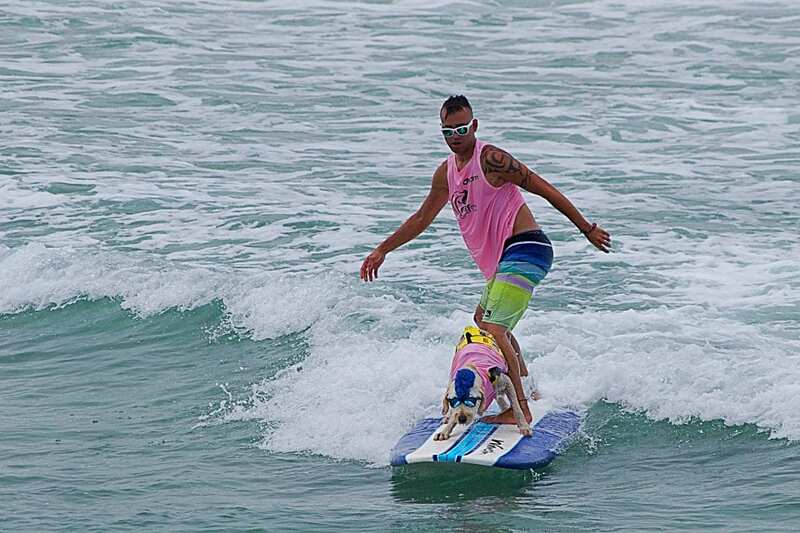 To get up on that face and feel the board sliding downhill. 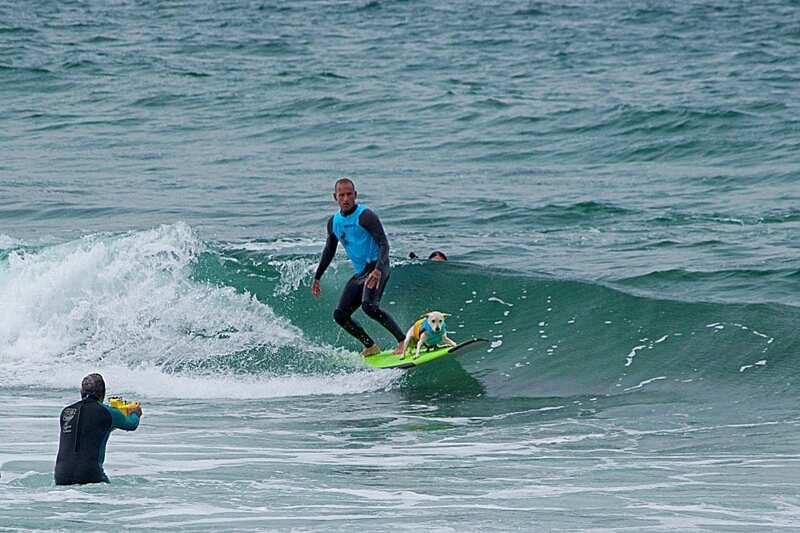 Today, I watched a dog catch my wave. 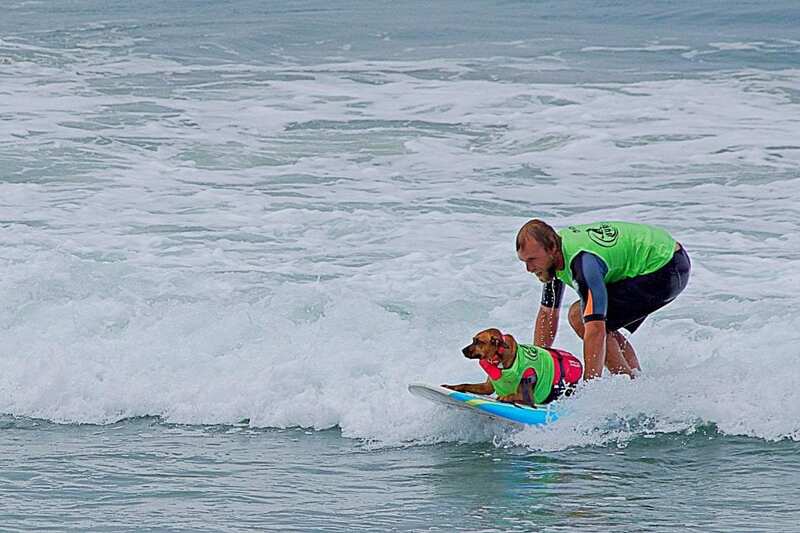 Sugar and Ryan won the human / dog and tandem events based upon the strength of one good wave. 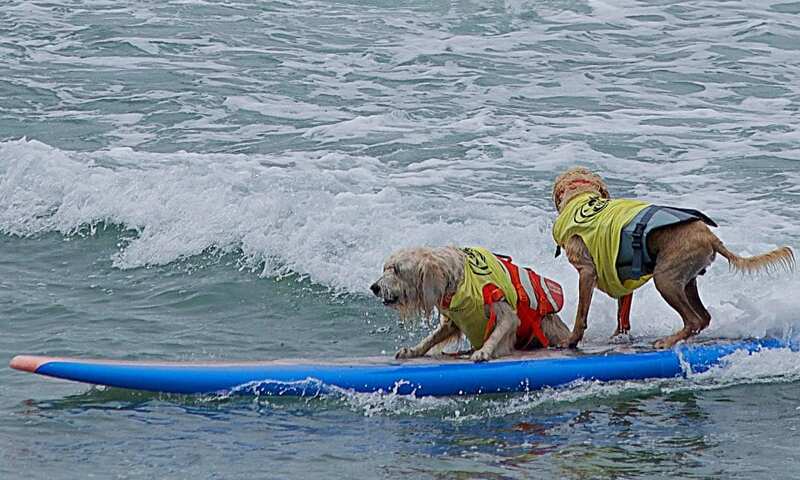 The way scoring works, you get scored on the average of your two highest waves. It’s quality of quantity. It wasn’t an accident either. Sugar won the shredding competition too. 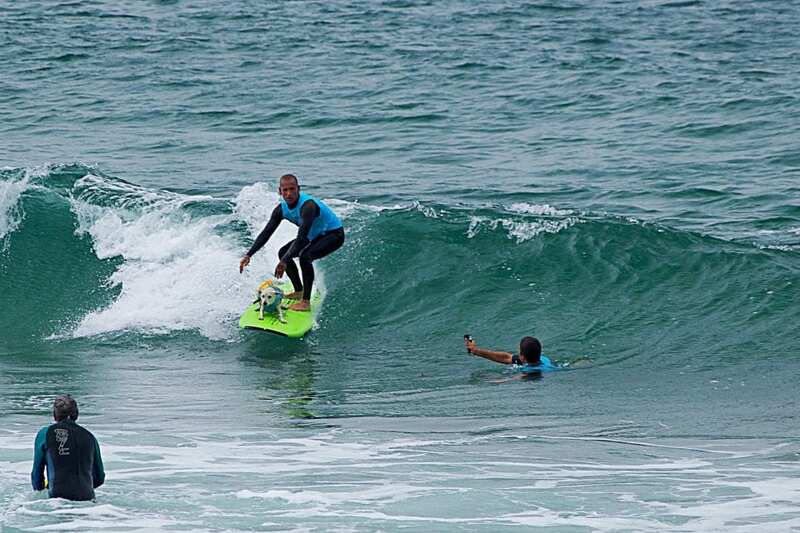 I wonder if I could sweet talk Ryan into lining me up on that perfect wave face? 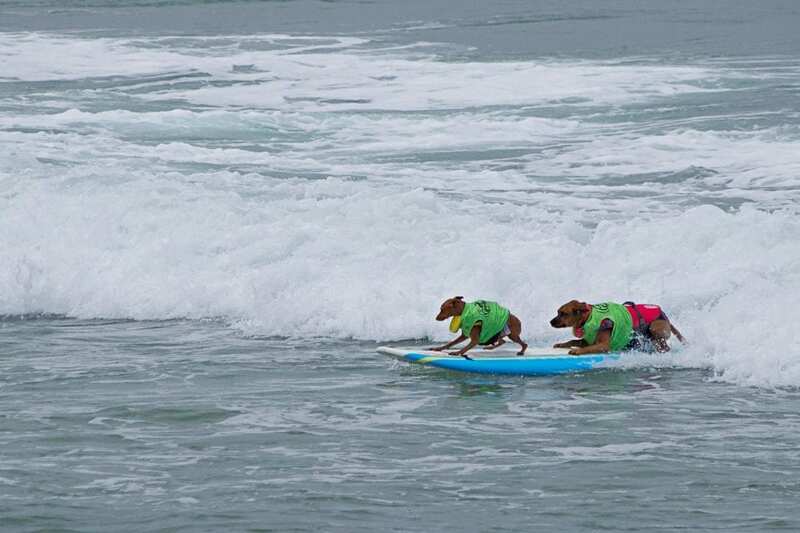 You could tell some dogs really love surfing and Rusty was one of those dogs. My childhood dog, Bud, used to love sledding. Every time I would start down the hill, she would jump on. She loved canoeing too. She would sit up in the bow and drink as we rolled down the river. 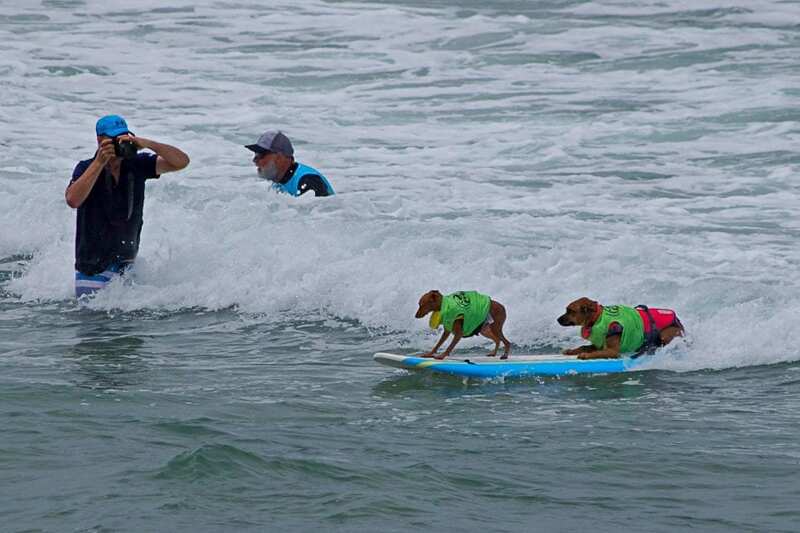 Rusty was so excited surfing. Rusty and Giselle won the dog/dog competition. 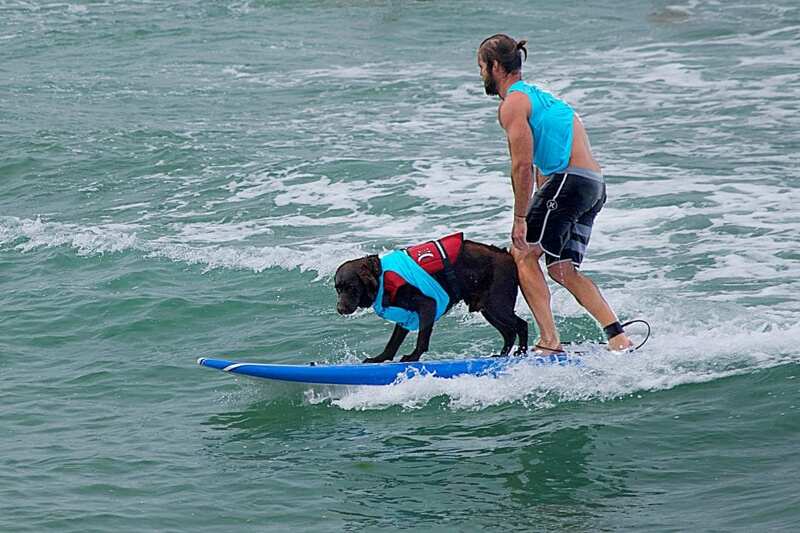 Of course, it was his back dog Giselle who placed second with the dog/human tandem with the owner Jonah and not the ever eager Rusty. 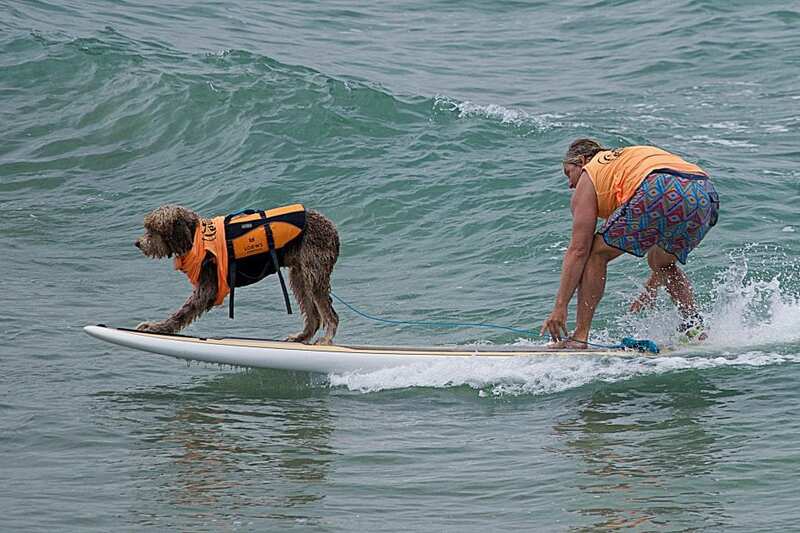 Yup, Rusty sure loved surfing. 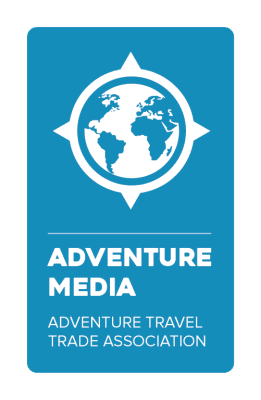 Fire, Torrie, Kai and Jessie…. 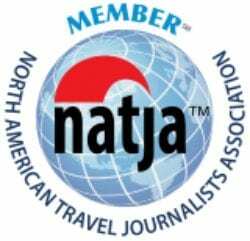 The jury is still out. They are water dogs for sure, most Nova Scotia Duck Tolling Retrievers are. 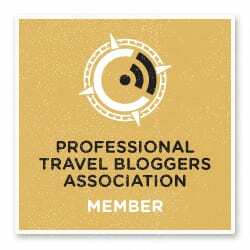 It’s just the little tells, like not facing forward on the board and bailing when you reach the beach that makes me wonder. 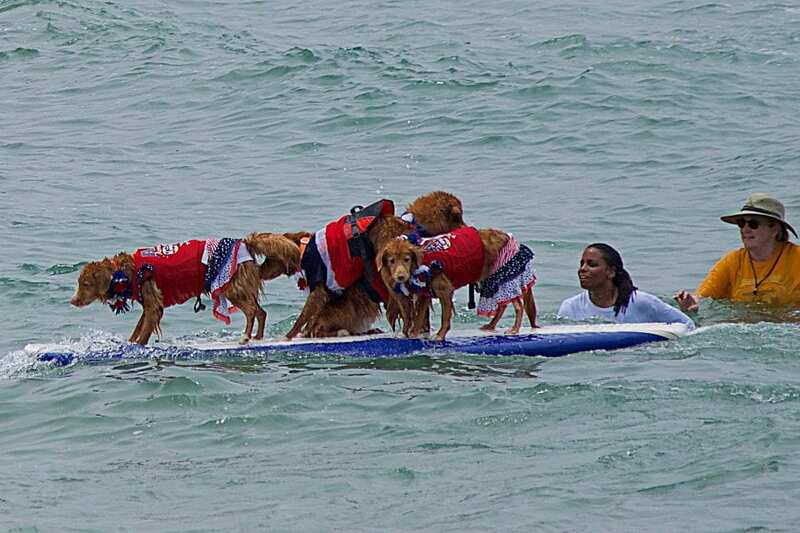 Torri and Kai both won their weight classes and the foursome came in third in the dog/dog (dog/dog/dog/dog) heat so maybe it’s just an issue of putting four dogs on a surfboard. 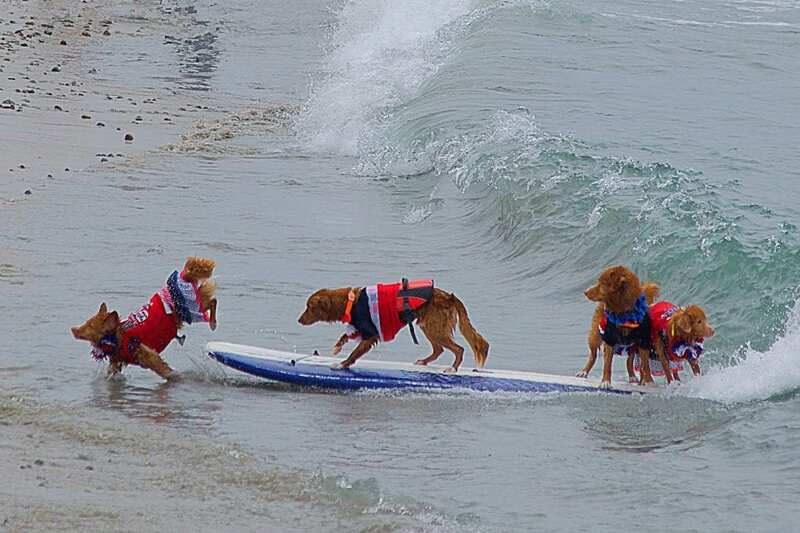 On the bright side, they all did reach the beach so that’s not half bad surfing. I’m no fashionista but I think that Derby and his owner had it doing on. Loved the matching mohawks and sun glasses. What self respecting dog would go to the beach without their sunglasses? Of course, the thing about looking cool is. You always look cool, until you don’t. 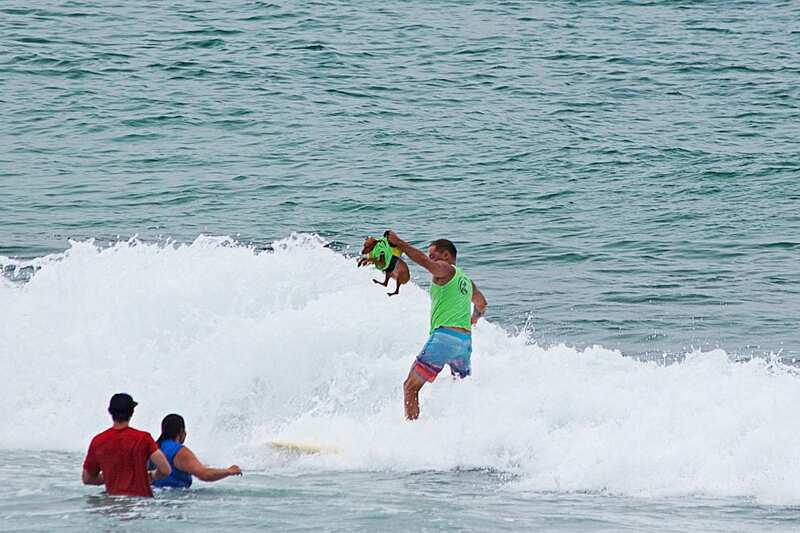 The strength of the dog is the pack and the strength of the pack is the dog and there were a pack of dogs out surfing in Imperial Beach. I could come up with witty banter, but it would only get in the way of seeing more pictures. 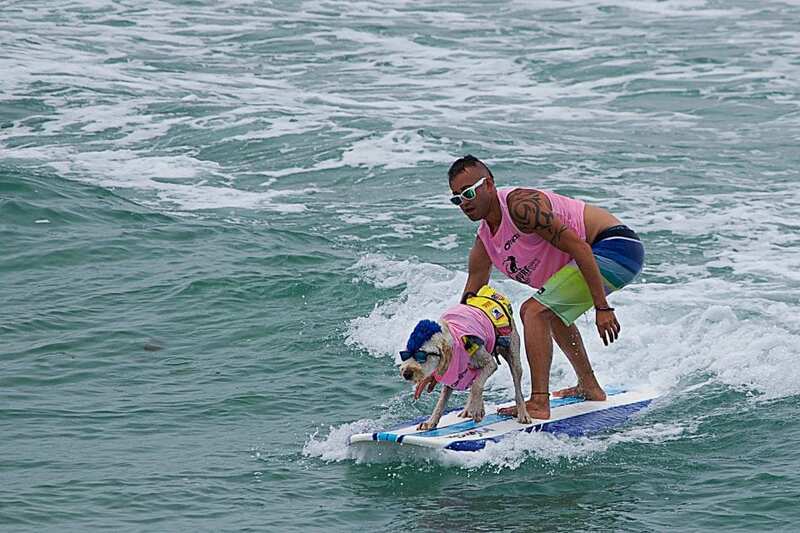 If you like what you see, share this article with a friend or maybe even come and check out dog surfing in person. It’s as cute as it looks and the proceeds go to help dogs in need. 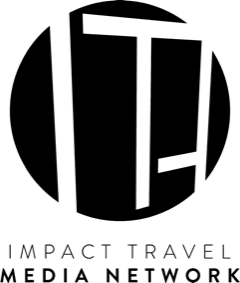 NextWhat Makes Indy Cool and Why Does It Taste So Good?